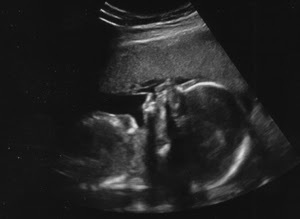 Our 20-week ultrasound was perfect! 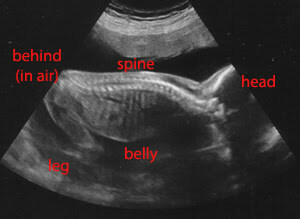 The baby looks perfect, we didn't find out the gender (didn't want to! ), and it eases my mind to know that everything is OK in there. ...and some kinda scary alien-looking pictures. Not a big fan of those 4D ones, but they were good for making out baby positioning. Ryan thinks they make the baby look like a boy, and Lori thinks they make the baby look like Lily, i.e. another girl. We shall see! I can't believe how quickly this pregnancy is going! I'm writing this at 23.5 weeks. 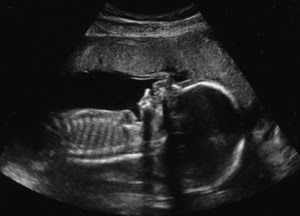 Another month or so, and the baby will technically be old enough to live outside the womb, though not without many complications, should some unknown circumstance cause that to happen. That also eases my mind a little. And also makes me a little antsy. We're so looking forward to meeting our next little stinker!